"The ARX 91 can reach the same compaction goals as heavier competitive models - but with lower fuel consumption and reduced operation and maintenance costs," Patel said. Ammann has introduced the ARX 91 Articulated Tandem Roller, a machine that is able to compact from thin to thick asphalt layers in fewer passes with its high compaction output. "A combination of drum dimensions, frequencies and amplitudes provide productivity and flexibility on a variety of jobsites," said Dhruv Patel, Global Product Strategy - Machines. "The combination of features and setting possibilities, in addition to a unique propulsion system, help the ARX 91 efficiently achieve optimum compaction results. "The machine's high output enables compaction goals to be met in minimal passes. "The ARX 91 can reach the same compaction goals as heavier competitive models - but with lower fuel consumption and reduced operation and maintenance costs," Patel said. Applications include medium and large jobsites, including paving projects related to infrastructure, such as roads, airfields, harbours and parking lots. The ARX is particularly adept at compacting from thin to thick layers of asphalt. The compactor utilizes a Cummins BS-III/Tier 3/Stage 3A engine. With a weight of 9 tonnes, it serves a highly demanded market segment. The machine's propulsion system is unique to the market. It utilizes an efficient hydraulic system, traction control and speed sensors. This enables smooth starts and stops that improve asphalt mat quality. The location of the engine in the rear of the roller is another advantage. This placement helps drive vibration away from the operator and toward the compaction target. It also improves visibility and redirects heat from the operator, thereby increasing comfort. The machine's electronic joystick controls are intuitive, helping even inexperienced operators succeed. A tight turning radius improves operator control and manoeuvrability. A large water tank (1000 litres) minimizes the need for refills. The ARX 91 has maximum working speed of 7 km/h, maximum travel speed of 12 km/h and gradeability of up to 40 per cent. Ammann Compaction Expert (ACE), Ammann's proprietary Intelligent Compaction system, is available as an option. ACE monitors density and provides feedback, helping to reduce the number of passes. It also eliminates both overcompaction and undercompaction and reduces fuel consumption. Ease of maintenance is an added benefit. All service and maintenance points can be accessed from the ground, and bearings are self-lubricating. The fully autonomous Robomag tandem roller can be used completely independently in a defined work area. For loading or manual operation, the Robomag tandem roller can be operated simply by remote control. Vögele's latest high-performance large paver for layer thicknesses up to 50 cm, fixed-width screeds and new solutions for the networked jobsite will be shown at bauma 2019. Case Construction Equipment has introduced the latest additions to the DV Series of vibratory rollers. With models available in both double drum and combination (front drum with rear pneumatic tires) configurations, these rollers are powerful, easy to transport and nimble enough to work in a variety of residential and commercial construction applications where the operator may encounter tight quarters, curbs, structures and other obstacles. Due to the rapid increase in heavy-duty transport, the global road network is showing visible signs of aging in many places. In order to ensure that the road infrastructure remains functional over the long term, roads are increasingly requiring structural rehabilitation. Wirtgen developed the high-performance W 380 CRi cold recycler specifically to meet these requirements. This innovative machine will be unveiled to the world at the Bauma trade show. Wacker Neuson has updated its 1.2-ton tandem vibratory roller line to include improved visibility, curb clearance and easier service access. The RD12 series has dominated the industry since it was originally developed and introduced to the North American market 30 years ago. These popular ride-on rollers are the perfect fit for residential and commercial construction for asphalt and subbase soil compaction of parking lots, driveways, secondary roads and nature trails. Additionally, they are an excellent choice for landscape and golf course contractors to statically roll sod, fairways and greens. Volvo Construction Equipment is adding the P7110B and P7170B asphalt pavers to the company's Lifetime Frame and Structure Warranty program and also expanding the pavers' extended warranty. The warranties come standard on machines delivered on or after Jan. 1, 2019. 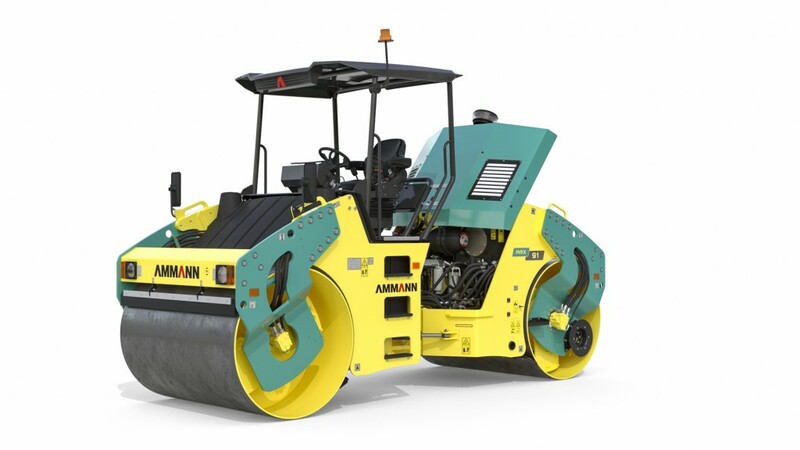 Ammann's new tired roller features a new cab and a unique ballasting system that can be quickly and significantly adjusted. Excellent serviceability is another key feature. Carlson Paving Products, Inc., an Astec Industries Company, is set to unveil its new wheel paver platform at bauma 2019 in Munich, Germany. The global debut of the CP60 and CP65 wheeled asphalt pavers represent the company's entry into the international 1.8m city paver market. New light tandem rollers from Ammann make it even easier for operators to work next to obstructions such as curbs. Carlson Paving Products, Inc. showcased the company's newest screed in Indianapolis: the EZR208. Completing the Tacoma-based manufacturer's lineup of rear-mount highway-class screeds available for all current North American paver models, the EZR208 is a technological leap forward for superior mat quality, performance, and wide width ability. Dynapac North America upgrades its commercial class paver range with the new FC1700C, FC1400 II, and FC1300 II. The new pavers are equipped with EPA Tier 4 Final certified emissions regulations-compliant engines and offer new features that takes the Dynapac commercial class paver range to the next level. The launch of the new FC1700 will take place at the National Pavement Expo in Nashville, TN. Carlson Paving Products, Inc. recently unveiled the all-new 2019 CP75 II at World of Asphalt. Featuring all-new ergonomic controls and the choice of material conveyor systems, the new CP75 II joins Carlson's line up of high performance and heavy duty commercial platforms for North American contractors. BOMAG introduces the new BF 300 series of commercial pavers that offers big paver features and efficiency in a 6-ft (1.8-m) paver. The rubber tire BF 300 P-2and BF 300 C-2 track pavers are designed to elevate paving quality and productivity, while reducing costs on a range of municipal, department of transportation, city development, and bike and cart path applications. Originally launched in 2017 for excavators, articulated haulers and wheel loaders, ActiveCare Direct is now available on select Volvo asphalt pavers. Starting February 2019, the P7110B and P7170B will be eligible for a one-year free subscription to ActiveCare Direct with a new machine purchase. Bridgestone Americas, Inc. will exhibit its integrated portfolio of off-the-road (OTR) products, technologies and services at the National Stone, Sand and Gravel Association Aggregates Academy and Expo (AGG1) and World of Asphalt 2019 Show and Conference, Feb. 12-14 in Indianapolis, Indiana. Located at booth 31089, Bridgestone will showcase the benefits of using products backed by integrated technologies to drive increased productivity for customers. The Mecalac Group has built its innovative reputation on designing and producing construction machinery for urban jobsites. Since the acquisition of the British facility at Coventry in 2017, backhoe loaders, site dumpers and compaction rollers have been added to the existing ranges of excavators and loaders. Case Construction Equipment has announced a new series of small-frame vibratory rollers. Available in both double drum and combination (front drum with rear pneumatic tires) configurations, these compact rollers are easy to transport and are ideal for working in residential and commercial construction applications where the operator may encounter tight quarters, curbs, structures and other obstacles. Bomag Americas, Inc. and Komatsu America Corp. are pleased to announce that Komatsu's six company owned dealerships (Edward Ehrbar, Komatsu Equipment Company, Komatsu Northeast, Komatsu Southwest, Midlantic Machinery and Pine Bush Equipment) have entered into an arrangement for the sale and support of Bomag compaction, milling, paving and reclaiming/stabilizing equipment for roadbuilding and other construction markets. For asphalt contractors to be successful in today's competitive paving market, paver and roller operators must acquire a deep knowledge of the equipment's features and put this knowledge into practice at the jobsite. With long-time equipment operators retiring at a high rate, the next generation of operators must receive extensive in-depth training on the equipment in order to meet project specifications without costly rework so companies can maximize equipment return on investment. Asphalt Drum Mixers, Inc. offers crane-set and self-erect asphalt storage silos, which are compatible with both the company's own and similar competitive models of asphalt plants. ADM silos are available in many configurations from single self-erecting silo to multiple crane-set silos and several drive-through configurations. Capacities are available between 30 and 300 tons. Custom designs and capacities are also available to accommodate any producer. November marked the four-year anniversary of the return of the segment-redefining Colorado midsize truck. Introduced as a 2015 model, the Colorado recorded its first full month of sales in October 2014. Since then, Canadian customers have bought 24,000 Colorados. The RD-1200XT pavement-drying unit from Greenville, South Carolina-based Road Dryer, LLC, quickly dries asphalt and concrete pavement, allowing crews to pave or apply surface treatments or striping after just one pass. The unit, which blows heated air up to 300° F directly downward through multiple nozzles, eliminates the risk of "flying objects," and allows traffic to flow in nearby lanes — reducing congestion caused by traffic restrictions. Available as a simple-to-operate trailer- or truck-mounted unit, the RD-1200XT can be adjusted for 8-ft to 12-ft (2.4m to 3.7m) drying widths. Because it dries pavement on demand, it provides flexibility for contractors and government agencies to meet timetables by minimizing delays from weather- and project-related wet conditions. Torwel Limited has announced its new and improved Heavy-Duty Snow Pushers in widths from 8' through 18'. All models boast robust design and upgrades that include adjustable skid/wear shoes and easy to use attachment systems that include the universal skid steer mounting system and the new versatile utility tractor/loader global mounting system. Trends in asphalt paving centre around making it easier and faster to lay down the highest quality pavement. In our latest in-depth report, our panel of experts from five manufacturers take a look at advances and technologies that are available in asphalt pavers, their current level of adoption, the advantages they offer, plus considerations when looking at the purchase of a new machine. JOSEPH VÖGELE AG are restructuring their extensive range of road pavers and screeds. The world market leader will be dividing its range into two lines: the Premium Line and the Classic Line. The company will also be subdividing its products into up to five classes within those lines. JOSEPH VÖGELE AG are further extending their range of service and training options for users: using a specially developed app and the associated web special, job-site professionals can now get to grips with the ErgoPlus 3 operating concept quickly and easily with the aid of numerous animations. Segregation - the separation of asphalt mats that can cause headaches for road maintenance crews - is a hot topic in the paving industry as more contracts include clauses regarding this challenging condition. As a long-time dealer and rental house serving northern Alberta's asphalt contractors, NC Equipment keeps track of the trends in the industry. As a full-time Dynapac dealer since 2017, it has taken the lead for its customers by bringing in a North American first to help reduce segregation problems on roadbuilding jobs. Topcon Positioning Group announces the complete acquisition of ThunderBuild BV Group, expanding the portfolio of Topcon paving solutions. Based in Eindhoven, the Netherlands, ThunderBuild develops software related to logistics management with a primary focus in the asphalt market, as well as additional applications that pertain to the transport of bulk materials. Registration is now open for Volvo's 2018–2019 Road Institute, the paving industry's premier training program. Offering a mix of classroom and hands-on training on a variety of operations and maintenance topics, sessions start in late October 2018 and continue through May 2019. ASTEC, INC., an Astec Industries company, announces the dates for the 2019 Customer Schools. Six weeks of schools are available. Attendees can choose to attend one of these sessions: January 7-10, January 14-17, January 21- 24, January 28- 31, February 4-7, or February 11-14, 2018. With 12 million tons of tear-off roofing material being generated each year in the United States, and increased regulations, the industry demands efficient recyclers. Efficiency is second nature to A-1 Sandrock. The company has rose to the challenge over the last few years, growing their shingle disposal program into a massive operation that's convenient for roofers, communities, North Carolina, and the surrounding states. Designed for use on granular materials and all types of asphalt-mix designs, the new Cat CW16 pneumatic (rubber-tire) roller is available as a standard nine-wheel model with a 69-inch (1,754-mm) compaction width or as an optional 11-wheel model with an 84-inch (2,132-mm) compaction width. The CW16 is designed for efficient performance on highways, city streets, county roads, lane additions, industrial sites, overlays, or other mid-size jobs. Neal Manufacturing, a Division of Blastcrete Equipment LLC, and a leader in asphalt pavement preservation equipment, offers its Asphalt Road Preservation Package for optimal efficiency and high-quality results on both detail and high-volume sealcoating applications. The package includes Neal Manufacturing's drivable DA 350 dual applicator for quick prep work and sealcoating around curbs and gutters, and its High-Volume Road Maintenance Vehicle that delivers high material output for efficiency on large projects. An indispensable tool for repair, maintenance and paving applications, the new Bomag BVP 12/50 A single-direction vibratory plate compactor is specifically designed and equipped for asphalt compaction, expanding the machine's use beyond traditional soil compaction. This asphalt specialist features a base plate specifically designed to avoid asphalt material pushing, shoving and scuffing to deliver a superior finish. The highly wear-resistant cast iron base plate delivers exceptional service life. W 150 CFi with 1800-mm milling drum assembly leads the Wirtgen line-up. Hamm's leading-edge CompactLine of 15 smaller-sized rollers combines cutting-edge design with practical functionality. The 9.9-ton (9-metric-tonne) DV+ 90i VV-S (vibration in both split drums), the DV+ 90i VO-S (vibration and oscillation in split drums), and DV+ 90i VT-S (vibration and pneumatic combi roller) are the latest tandem rollers in Hamm's DV+ series.